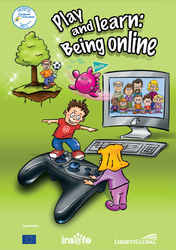 Have you downloaded your own copy of the brilliant 'E-safety Kit' called 'Play and Learn: Being Online'? Whilst this activity book offers children from 4 to 8 years of age 30 pages of fun and games, it also leads them to sharpen their basic language and mathematical, social and cultural skills. It gives them a glimpse of the impact modern technology can have on their everyday life. Above all it offers an opportunity for parents and teachers to sit together with their children and discuss these important issues.